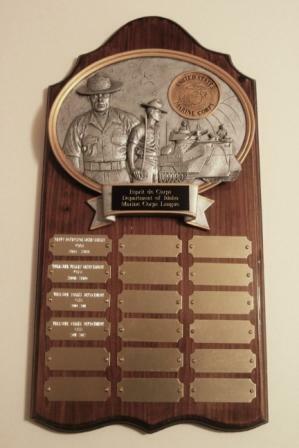 Members of the Marine Corps League join together in camaraderie and fellowship for the purpose of preserving the traditions and promoting the interests of the United States Marine Corps, banding together those who are now serving in the United States Marine Corps and those who have been honorably discharged from that service that they may effectively promote the ideals of American freedom and democracy, voluntarily aiding and rendering assistance to all Marines, former Marines, FMF Corpsmen and Chaplains and to their widows and orphans; and to perpetuate the history of the United States Marine Corps and by fitting acts to observe the anniversaries of historical occasions of particular interest to Marines. 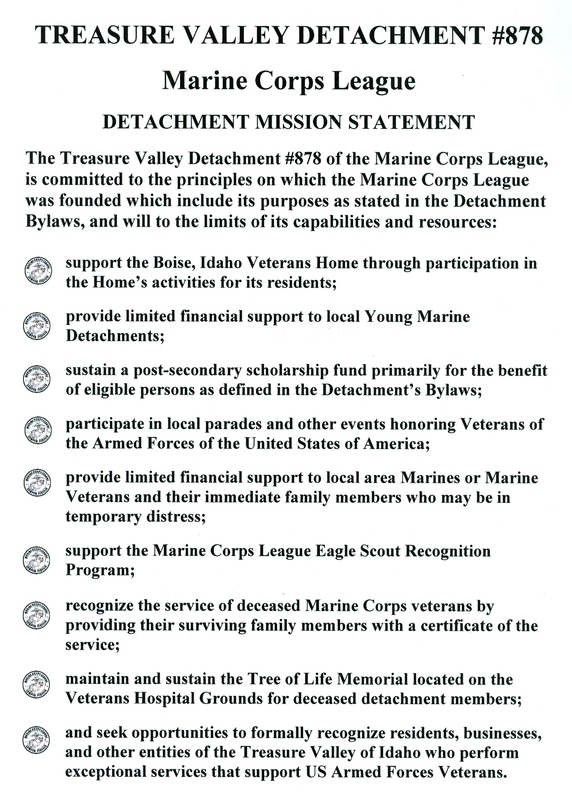 The decals on your vehicle, the markings on your shirt, or the hat you are wearing identify you as someone who is either a Marine or who has an interest in US Marine Corps; therefore, I invite you to consider joining the Treasure Valley Detachment of the Marine Corps league. The brochure accompanying this note provides basic information on the Marine Corps League. The Marine Corps League is a veterans’ service organization similar to the Veterans of Foreign Wars and the American Legion. The primary difference in the MCL and other veterans’ service organizations is that the MCL limits full membership to currently serving and honorably discharged Marines and US Navy Hospital Corpsmen who have served with the operating forces of the Marine Corps, or Fleet Marine Force (FM F). That said, the MCL also has non-Marine and non-FMF Hospital Corpsmen associate members to help carry out the purposes of the league. Wives also are members of the MCL auxiliary. You may choose to join the league simply for the camaraderie gained from associating with other Marines or to fully participate in all of the activities of the Treasure Valley Detachment and the MCL. We gather informally every Saturday morning beginning about 8:00 AM from coffee and breakfast at Quinn’s Restaurant & lounge, 1005 Vista Ave., Boise. We have formal business meetings the third Thursday of every month September through June. We participate in a variety of activities at the Boise Veterans Home, and with Company C, 4th Tanks Battalion, US Marine Corps Reserve to celebrate the Marine Corps Birthday. We march in the Boise Veterans Day Parade, participate in the Memorial Day ceremony at the Boise Veterans Cemetery, and in a number of other activities that are in keeping with the purposes of the Marine Corps League. We also support the Young Marines organization. Preserve the traditions and promote the interests of the United States Marine Corps. Band together those now serving in the USMC and those honorably discharged to effectively promote the ideals of American freedom and democracy. Fit its members for duties of citizenship and encourage them to serve as able citizens. Hold sacred the history and memory of the men and women who gave their lives to the nation. Foster a love for the principles which they supported by blood and valor since the founding of the Republic. Maintain true allegiance to American institutions. Create a bond of comradeship between those in the Service and those who returned to civilian life. Provide voluntary aid and render assistance to all Marines and FMF Corpsman and former Marines and FMF Corpsman as well as their spouses, orphans, and parents. Perpetuate the history of the USMC and by fitting acts observe the anniversaries of historical occasions of particular interest to Marines.